Sozvezdiya.ru - Astronomy Encyclopedia. D.
D'Alembert Montes Range of mountains near riccioli on the Moon's west limb. Some peaks attain altitudes of 6000 m (20,000 ft). Its most famous peak is Table Mountain. Dall-Kirkham telescope Variation of the cassegrain telescope in which the primary is a concave prolate ellipsoid and the secondary is a convex sphere. This design is optically inferior to the Cassegrain, suffering from more severe coma and field curvature. However, the spherical curve on the secondary is far easier to manufacture than the convex hyperboloid in the Cassegrain. The English master optician Horace Edward Stafford Dall (1901-86) invented this design in 1928. It was the subject of correspondence between Oregon amateur telescope-maker Allan Kirkham and Albert G. ingalls, then editor of Scientific American, who named it the Dall-Kirkham. dark adaptation Physiological alteration of the eye's response to light in low-light environments. On moving from a well-lit area to darkness, the eye's pupil dilates to a maximum diameter of about 7 mm in a few seconds, but one still cannot see very well. Almost immediately the eye begins to manufacture rhodopsin (also called visual purple), a chemical that increases the eye's sensitivity by a factor of many thousands. In uninterrupted darkness rhodopsin will continue to build up for as long as 2 hours, but dark adaptation is largely complete after 30 minutes. dark nebula (absorption nebula) Cloud of dust and cool gas that is visible only because it blocks off the light of stars and nebulae beyond it. Dark nebulae range in size from minute, more or less spherical Bok globules, usually seen in photographs against the bright glow of emission nebulae, through larger features like the horsehead nebula to the naked-eye clouds of the southern coalsack and the gigantic rho ophiuchi dark cloud, which affects 1000 square degrees (2%) of the sky. The clouds consist of a mixture of dusty particles and gas, the whole having a composition similar to the standard cosmic abundance of about 75% hydrogen and 23% helium with the rest heavier elements. The dust particles are probably less than a micrometre in size and comprise only about 0.1% of the mass of a cloud. The particles are, however, believed to play an important part in the formation of molecules in space. The outside of the dust particles provides a surface to which atoms within the cloud can adhere and perhaps combine with others to form simple molecules, such as H2, or much more complicated compounds, such as formaldehyde or even amino acids (see cosmochemistry and interstellar molecules). These relatively fragile compounds are protected from energetic ultraviolet radiation from stars by the cloud itself. The interiors of these molecular clouds are thus very cold, typically only 10 K, which allows them gradually to collapse under their own gravity, and eventually to begin the process of star formation. Dactyl The tiny satellite of asteroid (243) Ida was discovered during the Galileo flyby on 1993 August 28. This is the most detailed image obtained, showing features as small as 40 m (130 ft). dark nebula A dark nebula may reveal itself by obscuring rich starfields behind it, and such objects are often seen in rich Milky Way regions as in this photograph. Danjon, Andre-Louis (1890-1967) French astronomer who directed the observatories at Strasbourg and Paris, and improved instruments, especially for positional astronomy. From the 1920s he developed accurate photometers (and established the danjon scale), and in 1951 he invented the Danjon astrolabe, an accurate transit instrument used for measuring star positions. Danjon scale Fairly arbitrary five-point scale devised by the French astronomer Andre Danjon, used to describe the relative darkness of lunar eclipses. The scale ranges from 0, a very dark eclipse, during which the Moon almost becomes invisible, to 4, which indicates a bright eclipse, where the Moon may show a strong red colour but remains easily visible. Variations in the eclipsed Moon's brightness from one event to another result mainly from the changing dust and cloud content of Earth's atmosphere. Eclipses that follow major volcanic eruptions are often notably dark. D'Arrest, Comet 6P/ Short-period comet discovered by Heinrich D'Arrest, Leipzig, Germany, in 1851. The comet has an orbital period of 6.51 years and is usually faint. The 1976 August return, however, was unusually favourable, with perihelion and closest approach to Earth coinciding, and the comet reaching magnitude +4.9. Comet 6P/D'Ar-rest has been seen at 17 returns up to that of 1995. D'Arrest, Heinrich Louis (1822-75) German astronomer who in 1846, working with Johann galle, found Neptune, based upon theoretical orbital calculations by Urbain le verrier. D'Arrest discovered three comets and one asteroid. In 1858 he became professor of astronomy at Copenhagen, and director of the observatory there. He published measurements of nebulae in 1858 and 1867.
data centre, astronomical Organization that collects astronomical data, from either ground- or space-based observatories or both, and organizes it into searchable databases, thus acting as an information hub, or provides on-line bibliographic, abstracting and other services. The archiving function of data centres is also important. A prime purpose of astronomical data centres is to maintain and correlate electronic versions of the thousands of catalogues of celestial objects. The first such centre was established at Strasbourg, France, with the aim of collating all the various identifications of the same objects in different catalogues. Now called the centre de donnees astronomiques de strasbourg, it maintains the world's main database for astronomical objects. NASA has a number of data centres. They include the astronomical data center; the Infrared Processing and Analysis Center (IPAC), at Caltech, Los Angeles, which maintains the National Extragalactic Database (NED); and the National Space Science Data Center (NSSDC), which provides access to a wide variety of astrophysics, space physics, solar physics, lunar and planetary data from NASA missions. It also maintains the Astrophysics Data System (ADS), a major abstracting service. Other centres include the Canadian Astronomy Data Centre (CADC), and the Astronomical Data Analysis Center (ADAC) run by the National Astronomical Observatory of Japan. Davida Fifth-largest main-belt asteroid; number 511. Davida was discovered in 1903. It has a diameter of about 325 km (202 mi). David Dunlap Observatory (DDO) Research centre of the University of Toronto, Canada, situated at Richmond Hill, Ontario some 20 km (12 mi) north of Toronto, opened in 1935. The DDO was funded through a bequest from the estate of David Dunlap (1863-1924), a wealthy Ontario amateur astronomer. Its principal instrument is a 1.88-m (74-in.) reflector, which was the world's second-largest telescope when it was built. Today's University of Toronto astronomers carry out their research with major international facilities such as the canada-france-hawaii telescope and the gemini observatory. Dawes, William Rutter (1799-1868) English physician, clergyman and amateur double-star observer who devised the empirical formula used to measure telescope resolution (see dawes' limit). He established a private observatory in Lancashire (1829) where he measured the distance and separation of more than 200 double stars, acquiring the nickname the Eagle-eyed because of his acute vision. Later, Dawes made systematic observations of the planets, especially Mars and Jupiter, and in 1850 independently discovered Saturn's semi-transparent Crepe Ring (the c ring). where R is the angular resolution in arcseconds, D the diameter in millimetres and D' the diameter in inches. Dawes' limit applies to the angular separation of two stars of equal magnitude under conditions of perfect seeing. In practice, Dawes' limit is never reached, mainly because of atmospheric turbulence. day Time taken for the Earth to complete one rotation on its axis. It can be measured in a number of different ways. A sidereal day is the interval between two successive passages across the meridian of the first point of aries (the zero of right ascension) and is equivalent to 23h 56m 4s.091. It is considered to be a true measure of the rotation period because the stars, which are used as reference points, are so far away that in this context they may be regarded as infinitely remote. An apparent solar day is the interval between two successive passages across the meridian of the true Sun. Its length is not uniform, however. Due to the Earth's elliptical orbit, and the fact that the Sun appears to move along the ecliptic rather than the celestial equator, an apparent solar day varies by as much as 16 minutes during the course of a year (see apparent solar time). A mean solar day is the interval between two successive passages across the meridian of a fictitious, or mean sun (see mean solar time). Because of the Sun's movement relative to the background stars, at a rate of about one degree per day in an easterly direction, the mean solar day is slightly longer than a sidereal day, at 24h 3m 56s.555. A civil day begins and ends at midnight and comprises two 12-hour periods, am and pm. These are never used in an astronomical context, however, where the 24-hour clock is always quoted. daylight meteor stream Meteor stream that produces activity from a radiant too close to the Sun in the sky to allow direct (visual or photographic) observations. Instead, the meteor shower associated with the stream has to be observed by radio methods. Notable examples include the beta taurids and the Daytime Arietids, both of which are active during June. decametric radiation Radio waves having wavelengths of a few tens of metres or a few decametres, that is, from 10 up to l00 m (30 to 3 MHz). It includes most HF radio frequencies and the upper part of the MF band. where H0 is the hubble constant and p is the density of the Universe. If q0 = 0 the Universe is flat and expands at a constant speed for ever. See also big bang theory. de Cheseaux, Comet (C/1743 X1) Brilliant multitailed comet of 1743—14, discovered independently by Dirk Klinkenberg (1709-99) on December 9 and Philippe de Cheseaux (1718-51) on December 13. It reached apparent magnitude —7 around its 1744 March 1 perihelion. decimetric radiation Radio waves having wavelengths of a few tenths of a metre or a few decimetres, that is, from 0.1 up to 1m (3 to 0.3 GHz). It includes most UHF radio frequencies and the upper part of the VHF band. declination (dec., 8) Measure of angular distance, north or south of the celestial equator; it is one of the two coordinates of the equatorial coordinate system, the other being right ascension. Designated by the Greek letter 8, declination is measured from 0° to +90° between the celestial equator and the north celestial pole, and from 0° to — 90° between the celestial equator and the south celestial pole. deconvolution Removal of imperfections in the signal received by an instrument. When an astronomical object is observed with any instrument (such as a telescope plus detector, for example), the instrument smears the radiation in its own characteristic way. The most obvious examples are the spiking seen on the optical images of bright stars, caused by the spider support for the secondary mirror, and the broad spots on the image rather than single points for the stellar images. The process of removing the effect of the instrument is called deconvolu-tion, and it involves understanding and modelling the effects very thoroughly with a computer. The instrumental effect (the instrumental profile) is often approximated by a Gaussian distribution function because this is easy to correct computationally. decoupling era Period when matter began to evolve separately from the cosmic microwave background. During the early stages of the big bang, the universe was much smaller, denser and hotter than it is now, and it was essentially radiation dominated. The photon density was so high that the formation of normal atoms and molecules was not possible. As the universe expanded and cooled, the radiation density decreased more rapidly than the matter density, and after several thousand years the universe became optically thin to radiation, and matter evolved separately from the background radiation. This transition is called decoupling and this era can be studied through the cosmic microwave background radiation. 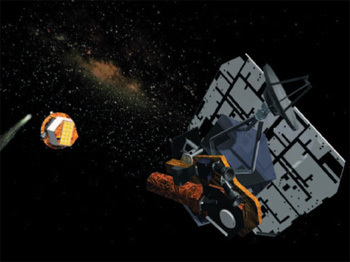 Deep Impact NASA Discovery-class mission, to be launched in 2004 January, to impact a 498-kg instrumented cylindrical copper projectile into the nucleus of Comet 9P/Tempel 1 in 2005 July. The impact, at a speed of 32,200 km/h (20,000 mph), will create a 100-m (330-ft) diameter, 8-m (26-ft) deep crater, exposing pristine interior material and debris from the comet, which will be studied by a high-resolution camera and an infrared spectrometer on the mother craft and by ground- and space-based observatories. Deep Impact An artist’s impression of the Deep Impact probe releasing its projectile toward Comet 9P/Tempel. It is hoped that the mission will allow study of pristine cometary material exposed by the projectile’s impact. deep sky Expression used to define a celestial body that lies outside the Solar System. It can be applied to both galactic and extra-galactic objects such as star clusters, nebulae and galaxies, which are referred to as deep sky objects; it is rarely used to describe individual stars. Deep Space 1 (DS 1) First of NASA's newmillenni-um programme missions, launched in 1998 October, to demonstrate new technologies, including an ion propulsion system, an autonomous navigation system and an autonomous spacecraft computer, nicknamed the Controller. The national aeronautics and space administration (NASA) hopes such technologies will enable future science craft to be smaller, less expensive, more autonomous and capable of independent decision making, relying less on ground control. DS 1's rendezvous with the asteroid 9969 braille at a distance of 15 km (9.3 mi) in 1999 July accomplished the prime objective of the mission, although an imaging system malfunction prevented any good images being taken. DS 1 was then directed towards a bonus target - a rendezvous with Comet 19P/Borrelly in 2001 September. On the way to the comet, however, DS 1 experienced a serious problem when its star tracker was lost. A remarkable recovery by engineers, who reconfigured computer software on the spacecraft, enabled control to be restored. 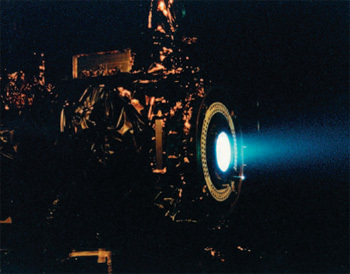 Deep Space 1 Test firing of the xenon ion engine of Deep Space 1. Launched in 1998 October, the spacecraft had a highly successful encounter with Comet 19P/Borrelly in 2001 September. Deep Space Network (DSN) Three Deep Space Communications Complexes used by NASA to track and communicate with space probes; they are operated by the jet propulsion laboratory. The first to be completed, in 1966, is the Goldstone Tracking Station in California's Mojave Desert, near Goldstone Dry Lake, about 70 km north of Barstow. The other two are at Robledo de Chavella, 60 km west of Madrid, Spain, and at Tidbinbilla Nature Reserve, 40 km south-west of Canberra, Australia. Between them, they can maintain contact with space probes as the Earth rotates. Each complex has two 34-m (110-ft) antennas, one 26-m (85-ft) antenna and one 70-m (200-ft) antenna, which can also be used as radio telescopes and for radar observations of nearby planets. defect of illumination Proportion of the disk of a planetary body that does not appear illuminated to an observer on Earth; measured as an angle in arcseconds. Also known as the terminator phase, the defect of illumination defines how much of a geometrical planetary disk is in darkness. It can also be expressed in terms of the angle of the terminator or the ratio of illuminated to non-illuminated areas. At opposition, there is no perceptible defect of illumination. deferent In the ptolemaic system and earlier systems, the large circle centred on the Earth, around which was supposed to move the centre of a small circle, the epicycle, around which a planet moved. degenerate matter Matter that is so dense, atomic particles are packed together until quantum effects support the material. Material within white dwarfs and neutron stars is degenerate. At the enormous temperatures and pressures that exist at the centres of stars, atoms are stripped of almost all of their electrons, leaving a gas of nuclei and electrons. Because these particles are much smaller than atoms, such a gas can be compressed to much higher densities than an ordinary gas. However, the PAULI EXCLUSION PRINCIPLE, which states that no FERMION can exist in the same quantum state, prevents particles getting too close together. In white dwarfs, or the centres of GIANT STARS and low-mass DWARF STARS, the electrons are degenerate; in neutron stars it is the neutrons that exert the degeneracy pressure. In degenerate matter the motions of the constituent particles are not determined by temperature, as they are in a normal gas, so a degenerate gas does not obey the usual gas laws. Degeneracy pressure is a function only of density. If energy is put into a degenerate gas the temperature rises, this being achieved by a fraction of the particles with previously restricted velocities moving to higher and unrestricted states. At a sufficiently high temperature all of the particles are removed from their degenerate condition. Degeneracy, therefore, can exist only at temperatures below what is called the Fermi temperature. Degree Angular-Scale Interferometer (DASI) Thirteen-element interferometer array designed to measure ripples in the cosmic microwave background radiation. It is located at the US National Science Foundation's Amundsen-Scott South Pole station. degree of arc Unit of angular measure equal to 1/360 part of a circle. The degree (symbol °) is subdivided into ARCMINUTES (') and ARCSECONDS ("), being 1/60 part and 1/360 part of a degree respectively. Angular measure is used widely in astronomy to determine the diameter or separation of celestial objects. Deimos Smaller of the two moons of MARS, the other being PHOBOS, discovered in 1877 by Asaph Hall. Deimos is irregular in shape, measuring about 15 X 12 X 10 km (9 X 7 X 6mi), with a mass of 1.8 X 1018 kg, giving it an average density of 1.7 g/cm3. It has a near-circular orbit tilted at an angle of 1°.8 to Mars' equator, at a distance of 23,460 km (14,580 mi) from the centre of the planet. This gives it an orbital period of 1.262 days, compared to the 1.026 days it takes Mars to rotate on its axis; in consequence, an observer on the surface of the planet would see Deimos moving slowly westwards across the sky, whereas Phobos would appear to move more rapidly eastwards. Deimos is a dark body (albedo 0.05), slightly red in coloration, and so is thought to be a captured ASTEROID with a composition similar to a CARBONACEOUS CHONDRITE. It is locked in SYNCHRONOUS ROTATION with Mars, such that its long axis is radially aligned with the planet. It shares these characteristics with its companion, Phobos. Small but conspicuous northern constellation, representing a dolphin, between Pegasus and Aquila. Its brightest stars are a Del (Sualocin), mag. 3.8, and P Del (Rotanev), mag. 3.6; backwards their names read 'Nicolaus Venator', the Latinized form of the Italian name of Niccolo Cacciatore (1780-1841), who was assistant and successor to Giuseppe PIAZZI, in whose catalogue of stars (1814) the names first appeared. y Del is a fine visual binary with orange and bluish-white components, mags. 4.3 and 5.2, separation 9".8. Deep-sky objects in Delphinus include NGC 7006, an 11th-magnitude globular cluster, which, at about 115,000 l.y. away, is one of the most distant known. Delaunay, Charles Eugene (1816-72) French engineer and mathematician, an expert in celestial mechanics. Twenty years' work on the lunar theory allowed Delaunay to reckon the latitude, longitude and parallax of the Moon to within 1 ". In 1870 he was appointed director of the PARIS OBSERVATORY. Delta Workhorse of the US satellite launcher programme since 1960, originally based on a Thor intermediate-range ballistic missile first stage. The original Thor Delta vehicle has been upgraded many times during a 40-year period of almost 300 satellite launches. Today, the Delta II and III models are operational. A new Delta IV is under production as a US Air Force Evolved Expendable Launch Vehicle, which will eventually be available commercially. The Delta II carries mainly US Air Force Navstar navigation satellites and NASA payloads, including Mars probes. The Delta III and IV are being marketed for commercial launches, mainly to geostationary transfer orbit (GTO). By 2002 the carrying capacity of these Deltas to GTO ranged from 3.8 to 13 tonnes. Delta Aquarids METEOR SHOWER active between July 15 and August 20 each year. The RADIANT has northern and southern components, the latter (near 8 Aquarii) being the more active at its July 29 peak, with zenithal hourly rate (ZHR) around 20. The northern branch, from close to the 'Water Jar' asterism, peaks around August 6. Deneb The star a Cygni, visual mag. 1.25, distance about 3200 l.y. Deneb is a blue-white supergiant of spectral type A2 Ia, with a luminosity nearly 500,000 times that of the Sun. It is the most distant and most luminous of all first-magnitude stars. Its name comes from the Arabic word dhanab, meaning 'tail', since it marks the tail of Cygnus, the swan. Deneb Kaitos (Diphda) The star P Ceti, visual mag.2.04, distance 96 l.y. It is a yellow giant of spectral type G9 III. The name comes from an Arabic phrase referring to the tail of the sea-monster (Cetus), which is where it is positioned. An alternative name is Diphda, from the Arabic for 'frog', which is what it once represented to Arab astronomers. Denebola The star P Leonis, visual mag. 2.14, distance 36 l.y., spectral type A3 V. Its name comes from the Arabic meaning 'lion's tail', which is where it lies. Denning, William Frederick (1848-1931) English amateur observer of meteors and comets who identified and mapped the radiants for many meteor showers. In 1899 he published a comprehensive catalogue of radiants and was able to prove that the radiant for the Perseid meteor shower slowly drifted eastwards as the Earth moved through the meteor stream. Denning discovered four comets, and Nova Cygni 1920. His studies of Jupiter's great red spot suggested that this, or a very similar, feature had been seen by Robert Hooke and Giovanni Cassini in the 1660s, and by others as late as 1713, after which it was not again widely observed until 1878.
density Ratio of mass to volume for a given material or object. The average density of a body is its total mass divided by its total volume. Substances that are light for their size have a low density and vice versa. Water has a density of 1000 kg/m3 under standard conditions. A wide variation in density is found throughout the Universe, ranging from about l0~20 kg/m3 for the interstellar gas to over 1017 kg/m3 for neutron stars. The average density of matter in the entire Universe is thought to be about l0~28 kg/m3. A typical white dwarf star has a density of between 107 and 1011 kg/m3. A normal matchbox containing white dwarf material would have a mass of some 250 tonnes, while if it were filled with material from a neutron star its mass would be 5,000,000,000 tonnes. If A is greater than one, the universe would be closed and eventually collapse back upon itself. If A is equal to one then the universe is flat but will continue to expand forever. If A is less than one, the universe is open and will expand forever faster and faster. See also closed universe; open universe. density wave theory Explanation for the common occurrence of spiral arms in galaxies, when any arms that are simply lines of material should wind up in a relatively short cosmic time and lose their identity. The density wave theory, worked out by Chia Chiao Lin (1916-) and Frank Shu (1943- ), identifies kinds of wave patterns that can propagate as coherent spirals through disks. 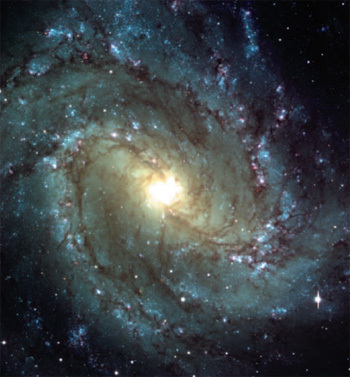 In this theory, spiral arms are patterns through which stars and gas move, with the pattern moving at a different speed. The arms would appear enhanced because the extra mass in the arms keeps stars and gas there longer than they would be in the absence of the extra density, and star formation is triggered in molecular clouds by the denser environment. This theory probably applies to 'grand-design' spiral galaxies, many of which have close companions whose gravitational perturbations would excite the requisite density wave. density wave theory Blue young stars and red HII emission nebulae clearly mark out regions of star formation in the face-on spiral galaxy M83 in Hydra. The spiral structure is thought to result from density waves in such galaxies. De revolutionibus orbium coelestium ('On the Revolution of the Heavenly Spheres') Nicholas copernicus' masterpiece in which he set forth what is now called the copernican system, his heliocentric theory of the Solar System. Although it was published in 1543, the year of Copernicus' death, it took more than a century for its cosmology to become widely accepted. Publication was overseen by the German theologian Andreas Osiander (1498-1552), who without Copernicus' knowledge inserted a preface stating that the heliocentric Solar System was not real, but merely an aid to calculating planetary positions. But the clear intention of the work itself is to promote a Sun-centred system. Much of De revolutionibus is concerned with geometrical derivations and tables for predicting the positions of the Sun, Moon and planets. Because the elliptical shape of planetary orbits had not yet been discovered, complicated epicycles were still required, as in the ptolemaic system, and in that respect the new theory was not much of an improvement on the previous one. Descartes Concentric lunar crater (11°.5S 15°.5E), 50 km (31 mi) in diameter. The outline of Descartes is difficult to discern; scattered hills are the sole remnants of the impact site's south rim. A sizeable bowl crater sits atop the south-west rim. The floor of Descartes is accented by several curved ridges that are roughly concentric with its south-east and north-west walls. Apollo 16 landed near Descartes. Desdemona One of the small inner satellites of uranus, discovered in 1986 by the voyager 2 imaging team. Desde-mona is about 58 km (36 mi) in size. It takes 0.474 days to circuit the planet, at a distance of 62,700 km (39,000 mi) from its centre, in a near-circular, near-equatorial orbit. de Sitter, Willem (1872-1934) Dutch astronomer and theoretical physicist who publicized relativity and helped to found 20th-century theoretical cosmology. His work was in celestial mechanics, including a re-determination of the fundamental constants of astronomy and refinement of the orbits of Jupiter's satellites. His double-star observations showed that the speed of light did not depend on source velocity (1913). The de Sitter model, which arose from his solution (1917) of Einstein's field equations of general relativity, was based on a hypothetical universe containing no matter. It suggested that the Universe was expanding, a conclusion that Einstein did not initially accept, choosing instead to 'prevent' the expansion mathematically by introducing the cosmolog-ical constant. The Einstein-de Sitter model, proposed by the two scientists in 1932, is a big bang universe that expands for ever. diamond-ring effect Sunlight shining through a valley on the lunar limb at the last moments before totality begins, or just as it ends, at a total solar eclipse produces the spectacular diamond ring. The dazzling bead of exposed photosphere appears as if mounted on the ring of the corona surrounding the dark, eclipsing body of the Moon. Despina One of the small inner satellites of neptune, discovered in 1989 by the voyager 2 imaging team. Despina is about 150 km (90 mi) in size. It takes 0.335 days to circuit the planet, at a distance of 52,500 km (32,600 mi) from its centre, in a near-circular, near-equatorial orbit. It appears to act as an interior shepherd moon to the planet's Le Verrier and Lassell rings. Destiny US laboratory module for the international space station. deuterium Heavy isotope of hydrogen. A deuterium nucleus contains one proton and one neutron and is denoted either by 21H or 21D. De Vaucouleurs, Gerard (1918-95) French-American astronomer (born Gerard Henri de Vaucouleurs), who spent much of his career (1965-95) at the mcdonald observatory, and specialized in galaxies and other aspects of observational cosmology. He measured the brightness and distance for hundreds of galaxies, working largely at mount stromlo observatory (1952-57). From these photometric measurements, he was able to map clusters of galaxies that themselves aggregated to form a 'local supercluster'. De Vaucouleurs' observations of galaxy distances suggested a high value for the Hubble constant, around 100 km/s/Mpc, implying a universe that was 50% 'younger' than widely believed. de Vico, Comet 122P/ Short-period comet discovered on 1846 February 20 by Francesco de Vico (1805-48), Rome, Italy. During its discovery apparition, the comet reached a peak magnitude +5.0, but no definitive orbit was calculated. A comet discovered independently on 1995 September 17by three Japanese observers (Yuji Nakamura, Masaaki Tanaka and Shonju Utsunomiya) was found to be identical to that seen in 1846; the previous return in 1922 April had been missed. Comet 122P/de Vico reached perihelion on 1995 October 6, again attaining peak magnitude + 5.0. The period is now known to be 74.41 years. de Vico-Swift, Comet 54P/ Short-period comet discovered on 1844 August 23 by Francesco de Vico (1805-48), Rome, Italy. Its short-period orbit was soon recognized, but poor weather and bad viewing geometry prevented further observations until it was discovered again by Edward Swift on 1894 November 21. Comet 54P/de Vico-Swift was next recovered in 1965 following calculations by Brian Marsden (1937- ) and Joachim Schubart (1928-). A close passage (0.16 AU) to Jupiter in 1968 increased the comet's orbital period to 6.3 years; its perihelion distance of 1.62 AU makes it unfavourably faint. dew cap Full-aperture extension placed around the end of a telescope (usually a refracting telescope or schmidt-cassegrain) that shields the front element to limit radiative cooling and subsequent condensation of moisture from the air upon the cold glass. Dew may be prevented from forming if the front element is surrounded by an electrically resistive wire loop giving out about 1-3 W of heat. Such 'dew zappers' are popular with amateur users of Schmidt-Cassegrain telescopes, and are also used to protect the lenses of cameras used for long-duration exposures in, for example, meteor photography. Dialogues Shortened English name of galileo's Dialogo sopra i due massimi sistemi del mondo ('Dialogue on Two Chief World Systems'). One of Galileo's most famous works, it was published in 1632 and contained his chief defence of the Copernican viewpoint. It was written in Italian and took the form of a conversation between three friends - Salviati, who represented Galileo's own point of view, Sagredo, an intelligent gentleman of Venice, and Simplicio, a rather dense Aristotelian. Its publication led to his trial before the Inquisition, for Copernicanism had been proscribed by a papal edict of 1616.
diamond-ring effect Spectacle seen at second contact or third contact - at the beginning or end of totality - in a total solar eclipse, when a single dazzling point of the solar disk remains or becomes visible shining through a depression on the Moon's limb, appearing as if mounted on a ring formed by the Sun's corona. dichotomy Exact half-phase of an inferior planet when 50% of the disk is illuminated and the terminator appears as a straight line. Although generally applied only to Mercury and Venus, the term is occasionally used to describe the half Moon. Dicke, Robert Henry (1916-97) American radio physicist who, in 1964, postulated that the Universe is pervaded by a 'background glow' of radiation at the microwave frequency that is a remnant of the big bang. This was confirmed in 1964 by Arno penzias and Robert Wilson, who detected radiation at the predicted wavelength of 3.2 cm. In the 1940s Dicke had pioneered the development of microwave radar, and in 1944 he invented the microwave radiometer, a key component of contemporary radio telescopes. He was also an accomplished theorist, making many refinements to general relativity, including the brans-dicke theory of gravitation. differential rotation Rotation of a gaseous or fluid body at a rate that differs with latitude: the equatorial regions rotate more quickly, and revolve faster, than higher-latitude polar ones. The differential rotation of the Sun persists from the photosphere down to the base of its convective zone (see solar interior). Differential rotation is also shown by the giant planets. A solid body like the Earth cannot undergo differential rotation: it must rotate so that the angular velocity and period of rotation is the same everywhere. differential rotation In a fluid body, such as a star or gas giant planet, the equatorial regions rotate more rapidly than the poles. As shown, a consequence of this is that a set of points lined up on the central meridian will become spread out in longitude over the course of a rotation. Points close to the equator will return to the central meridian earlier than those near the poles. differentiation Process by which a planetary body develops a layered structure. In a body that grows to a sufficient size by accretion, energy supplied by radioactivity, supplemented by kinetic energy of impacting bodies and gravitational compression, will cause melting in the interior. Under the action of gravity, denser material will sink towards the centre, and less dense material will rise towards the surface. These displacements release gravitational potential energy, heating the body further and causing additional melting; once begun, differentiation proceeds to completion on a short timescale. Differentiation of a terrestrial planet yields a nickel-iron core and rocky mantle and crust. The larger ice-rich satellites of the outer planets have differentiated into rocky cores and icy mantles. The distinct compositions of some meteorites, consisting of iron and/or igneous minerals, indicate that their parent asteroids differentiated and solidified before being disrupted by impacts. diffraction Slight spreading of a beam of light as it passes a sharp edge. If a beam of light strikes a hole, the beam that passes through the hole spreads slightly at the edges. A similar effect can be observed when waves in the sea hit the narrow opening of a harbour: as they pass into the harbour they begin to spread out. Because their wavelength is large compared to the harbour entrance the spread is large. The very short wavelength of light means that the effect is rarely noticed unless the opening is extremely small. However, the diffraction of light at the edges of a telescope aperture gives rise to the airy disk observed when a star image is examined at high magnification. The larger the aperture, and the shorter the wavelength, the smaller the Airy disk will be. Diffraction is used to good effect in a diffraction grating, where many very narrow adjacent holes (usually in the form of long slits) cause the spreading light beams to interfere with each other thus producing a spectrum. diffraction grating Optical device used to disperse light into a spectrum by means of a series of closely spaced, equidistant, parallel grooves ruled on to its surface. A typical grating will have several thousand such grooves per centimetre; light striking each individual slit is dispersed by diffraction into a spectrum. The grooves may be ruled on glass, producing a transmission grating, or on metal to give a reflection grating. Diffraction gratings produce quality high-dispersion spectra and are used in astronomical spectroscopes and spectrographs. diffuse nebula Term used in the mid-19th century for any nebulous object in the sky that did not resolve into stars when observed at high resolution. It thus included supernova remnants, planetary nebulae, reflection nebulae, distant galaxies and hot gas clouds. Nowadays it is taken to refer only to the hot gas clouds, and it is thus a somewhat archaic synonym for hii regions. Diffuse nebulae absorb ultraviolet radiation emitted by hot stars embedded within them. This ionizes the atoms within the nebula; the subsequent recombination of an ion and electron leads to the emission of the optical radiation. The nebulae vary considerably in general appearance depending upon the distribution of gas and stars within them, but the orion nebula and rosette nebula are good examples. Nebulae are often the sites of current or recent star formation. Digges, Leonard (c.1520-59) and Digges, Thomas (c.1545-95) English father and son who applied mathematical methods to surveying, navigation and ballistics. In 1553 Leonard Digges published A General Prognostication, one of the earliest astronomical almanacs. As well as astronomical data, it contained practical information on instruments and methods, such as finding local time from star positions. Thomas Digges published revised editions of his father's works. Pantometria (1571) covers surveying and cartography and contains what some have interpreted as a description of a reflecting telescope. Prognostication Everlasting (1576) reiterates Leonard's support of the Sun-centred copernican system, and also makes a case for an infinite universe. Thomas' careful observations of Tycho's Star, the supernova of 1572, coupled with Tycho's own observations of it, have allowed modern astronomers to identify it with a known supernova remnant. direct motion (prograde motion) Orbital or rotational motion in the same direction as that of the Earth around the Sun, that is, anticlockwise when viewed from above the Sun's north pole. For motion to be classed as direct, the inclination of the axis of rotation or orbital motion must be less than 90°. The motion of all planets in the Solar System, and most of the satellites, is direct. Direct motion is also the term given to the regular west-to-east motion of bodies in the Solar System when viewed from Earth, relative to the background stars. disconnection event Shearing of a comet's ion tail, resulting from a change in the polarity of the interplanetary magnetic field. Disconnection events often occur when a comet encounters a sector boundary in the solar wind; they are usually followed by the development of a new, differently oriented ion tail. comets that appear around the time of sunspot maximum, when the solar wind is particularly turbulent, are especially prone to disconnection events. Discovery Name of the third space shuttle orbiter; it first flew in 1984. Discovery Name of a national aeronautics and space administration (NASA) science programme with the aim of flying diverse missions with a 'faster, better, cheaper' approach. disk galaxy Name given to any kind of galaxy in the form of a substantial thin disk of stars in roughly circular orbits about the centre; the brightness of the galaxy decreases with increasing distance from the centre. Disk galaxies include spiral galaxies (ordinary and barred) and lenticular (S0) systems. Some irregular galaxies also appear to have thin disks in ordered rotation, though their brightness profiles are less regular. Disks are thought to have been formed while material was still in the form of interstellar clouds, rather than dense stars, so that cloud collisions could remove energy and flatten the distribution into the existing disk. disk galaxy NGC 4945 is a classic disk galaxy at a distance of 13 million l.y. Disk galaxies have their stars mainly confined to a flat, thin circular region surrounding the nucleus. dispersion Separation of light into its constituent wavelengths by refraction or diffraction; it is produced by a lens, a prism or a grating. Chromatic dispersion also occurs in fibre-optics, where the speed of propagation is dependent on the colour. dispersion measure Column density of free electrons along the line of sight to an object. In practice it is of concern mainly for pulsars. The radio waves from the pulsar are delayed by interactions with the free electrons in space, with the lower frequencies being delayed more than the higher ones. Thus an individual pulse from the pulsar will have its high-frequency component received on Earth before the lower-frequency component. The delay between the receptions of the components of a pulse is called the differential dispersion and it increases as the dispersion measure increases. The unit for dispersion measure is m~2 but pc cm-3 is often to be found in the literature on the subject. distance modulus Difference between apparent magnitude (corrected for interstellar absorption) and absolute magnitude of a star or galaxy. It is a measure of the distance to an object, though absorption by the interstellar medium must be considered (see reddening). diurnal motion Apparent daily motion of a heavenly body across the sky from east to west, caused by the axial rotation of the Earth. At the poles, a celestial body appears to describe a circle in the sky parallel to the horizon. At other latitudes it describes an arc from horizon to horizon, the length of which varies with latitude and declination; its angle to the horizon varies with latitude alone. divided telescope (heliometer) Historical instrument for measuring very small angles, consisting of a refracting telescope with an objective lens cut in half. Each half was mounted on a graduated rack-and-pinion mechanism, so that when the two semi-lenses were slid against each other out of a common line of col-limation, the observer saw a split image. The half-lenses were mounted with high precision, and the superimposi-tion of their respective images could then be used to accurately measure very tiny angles. John dollond in London began to make divided achromatic lenses for angle-measuring purposes in the 1760s, although it was in the superb heliometers by Adolf Repsold (1793-1867) of Munich after 1835 that the instrument reached its peak of excellence. Dobsonian telescope Newtonian telescope equipped with a low, stable altazimuth mounting; its designer, by John Lowry Dobson (1915-), refers to it as a sidewalk telescope. For amateur instruments, the 'Dob' has advantages of economy and is stable enough for useful observation. The design can be applied to large telescopes, and has led to modern amateurs using instruments with far greater apertures - up to a metre (3 ft) or even more - than were common when it first emerged in the 1950s. A Dobsonian requires no great skill to build, and can be made from very simple parts. Dobsonian telescope This simple altazimuth mounting has enabled many amateur astronomers to construct large-aperture instruments comparatively cheaply. The Dobsonian offers considerable advantages of portability. The basic features of the mounting are a ground board (or baseplate), topped by Teflon pads on which rests a cradle (or rocker-box). A single loose bolt in the centre of the ground board keeps the cradle in place but allows it to turn in azimuth. The sides of the cradle have Teflon-lined semicircular cut-outs, to accommodate rings bolted to the side of a box or tube containing the primary mirror. The secondary may be in the same tube, or can be attached, with other components, before observing. Typically, the components are all made from lightweight materials, and the instrument can be disassembled into separate modules for added portability. Dollond, John (1706-61) English optician who invented the ACHROMATIC LENS. He combined lenses of two different types of glass - crown and flint - to greatly reduce CHROMATIC ABERRATION. Dollond, originally a silk-weaver, joined with his son, the optician Peter Dollond (1730-1820), in 1752 to form Dollond & Son, the first company to make achromatic telescopes in any great quantity. The firm lasted through four generations of the family. John Dollond also invented the heliometer, or DIVIDED TELESCOPE, with which the angular separation of two stars could be reckoned. dome, lunar Small (2-25 km/1-16 mi), gently sloping, generally circular feature found in the lunar maria. Domes are probably small shield volcanoes; they often have a small central pit crater, representing collapse around the vent. Lunar domes are basaltic in composition. Dominion Astrophysical Observatory (DAO) Canadian national centre for astronomical research at optical wavelengths, situated 10 km (6 mi) north of Victoria, British Columbia. A facility of the Herzberg Institute of Astrophysics, it was founded by John PLASKETT in 1916. Its 1.85-m (72-in.) telescope saw first light in 1918 May and was briefly the largest telescope in the world; a 1.2-m (48-in.) reflector was added later. Today's DAO astronomers also use such major international facilities as the CANADA-FRANCE-HAWAII TELESCOPE and the GEMINI OBSERVATORY. Dominion Radio Astrophysical Observatory (DRAO) Canadian national centre for astronomical research at radio wavelengths, and a facility of the Herzberg Institute of Astrophysics. It is located at Pentic-ton, British Columbia, 250 km (150 mi) east of Vancouver. The DRAO operates a seven-antenna synthesis telescope and a 26-m (85-ft) fully steerable antenna. Donati, Comet (C/1858 L1) Bright long-period comet discovered by G.B. DONATI on 1858 June 2. As it approached perihelion (0.58 AU), on 1858 September 30, Donati's Comet became spectacular. In early October, it reached magnitude —1, with a striking, curved dust tail stretching for 60° at the time of closest approach to Earth, on October 9. Two narrow ion tails were also evident. The comet was the first to be photographed (by William Usherwood, Surrey, England). It has an orbital period of about 2000 years. Donati, Giovanni Battista (1826-73) Italian astronomer who discovered six comets between 1854 and 1864. The most famous, Donati's Comet of 1858, was the most widely observed object of its kind, and beautifully detailed drawings of it encouraged astronomers to make the first serious studies of cometary morphology. Donati made the first spectroscopic observations of comets, from which, in 1864, he concluded that comet tails were made of gases. Doppler effect Phenomenon whereby the pitch of sound or the wavelength of light is altered by the relative velocity between the observer and the emitting object. The effect was first described for sound waves in 1842 by the Austrian physicist Christiaan Doppler (1803-53), who was director of the Vienna Physical Institute and professor at the University of Vienna. The French physicist Hippolyte Fizeau (1819-96) suggested the extension of the principle to light waves in 1848. 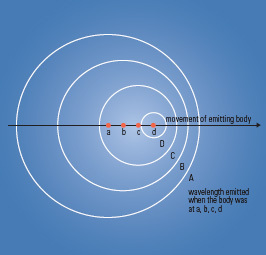 Doppler effect Electromagnetic waves emitted from a moving point source appear compressed ahead of, and more spread out away from, the direction of motion. The result is that, for light, the wavelength is shortened (blueshift) ahead of a source approaching the observer and lengthened (redshifted) behind a receding source such as a distant galaxy. The Doppler effect can be visualized by imagining a transmitter emitting pulses regularly. Each pulse travels out in all directions, producing a pattern of circles. If the transmitter is moving, each circle has a different centre. In the diagram, circles A, B, C and D were emitted when the source was at a, b, c and d. In the forwards direction the circles lie closer together, whilst behind the transmitter they are stretched apart. In the case of light, if an object approaches, the light it emits has shorter wave separations and so becomes bluer; if the object recedes, the light is reddened. The latter is the much referred-to REDSHIFT. Distant galaxies and quasars recede at speeds approaching that of light itself. 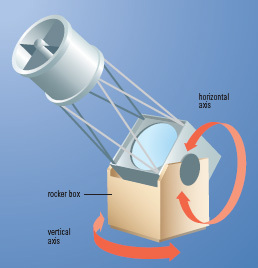 The relativistic Doppler formula must then be used, as follows: -4 Dobsonian telescope This simple altazimuth mounting has enabled many amateur astronomers to construct large-aperture instruments comparatively cheaply. The Dobsonian offers considerable advantages of portability. Small, inconspicuous southern constellation, representing a goldfish or swordfish, between Pictor and Reticulum. Dorado was introduced by Keyser and de Houtman at the end of the 16th century. Its brightest star, a Dor, is mag. 3.3; p Dor is one of the brightest of all cepheid variables (range 3.5-4.1, period 9.84 days). The constellation contains most of the large magellanic cloud, in which lie the extremely luminous eruptive variable S Dor (range 8.6-11.5; see s doradus star) and the tarantula nebula (NGC 2070); it was also the site of supernova sn 1987a. 1000 km/s (620 miles/s). DQ Herculis is an eclipsing binary with an orbital period of 4h 39m. The primary component is a white dwarf star and the secondary is a normal K or M dwarf (main-sequence star). In addition to eclipses and flickering, DQ Herculis shows regular variations in brightness with a range of a few per cent and a period of 71s.0745; the variations are thought to be caused by rotation of the white dwarf. Double Cluster (NGC 869 and 884) Pair of open star clusters in the northern constellation perseus. The pair is visible to the naked eye as a hazy patch sometimes referred to as the 'Sword Handle'; it is also catalogued as h and Chi Persei. Each cluster contains several hundred stars. NGC 869 (RA 02h 19m.0 dec. + 57°09') is the younger, with an estimated age of 6 million years. NGC 884 (RA 02h 22m.4 dec. + 57°07') is thought to be 14 million years old. Both clusters are products of a burst of recent star formation, which has given rise to the Perseus OB1 association in the next spiral arm of our Galaxy outwards from that occupied by the Sun. 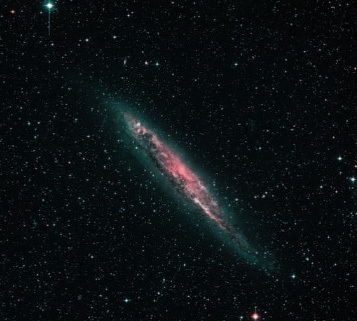 The distances of NGC 869 and NGC 884 are 7200 l.y. and 7500 l.y. respectively. Each has an apparent diameter of 29'. NGC 869 has overall magnitude + 5.3 and NGC 884 magnitude + 6.1. Double Double (Epsilon Lyrae) Quadruple star system near Vega (RA 18h 44m.3 dec. +39°40'), with two well-matched pairs separated by 208" (3'.5), making the star a naked-eye double. Telescopic examination shows each of the naked eye components to be double. Epsilon1 (pair A-B) has a separation of 2".6, components of mags. +5.4 and + 6.5 and an orbital period of 600 years. Epsilon2, the more southerly (C-D) pair, has components of mags. + 5.1 and +5.3, separated by 2".3, and an orbital period of 1200 years. The system lies 180 l.y. away. double star Two stars that appear close together on the sky. An optical double is a chance alignment: in reality the two stars lie at great distances from each other, but they appear to be close together as seen from the Earth. In physical doubles, or binary stars, the two stars lie close enough together to be gravitationally bound, orbiting about their common centre of mass (see barycentre). doublet Composite lens made up of two simple lenses. The lenses can be cemented together or separated by a small air gap; doublets are used as achromats in refracting telescopes and as elements in eyepieces. Drake, Frank Donald (1930- ) American radio astronomer who pioneered seti, the Search for Extra-Terrestrial Intelligence. Working at the national radio astronomy observatory, he played a key role in the first SETI survey, called Project Ozma, which in 1960 looked for artificial radio signals from the vicinity of the nearby stars t Ceti and e Eridani. He introduced the Drake equation as an attempt to estimate the number of planets in our Galaxy capable of supporting intelligent life. Draper, Henry (1837-82) American astronomer and equipment-maker. He took some of the best early photographs of the Moon, planets, comets, nebulae and the solar spectrum with a 28-inch (0.71-m) telescope he completed in 1872. That year, he took the first photograph of the spectrum of a bright star, Vega. To honour his work with photographic spectroscopy, his name was given to the henry draper catalogue, funded by a donation from his widow and astronomical assistant, Mary Palmer Draper (1839-1914). Henry's father was John William Draper (1811-82), an English scientist who emigrated to America in 1832, and some time in the winter of 1839/40 obtained the first photographic image (a Daguerrotype) of the Moon. drawtube Moving portion of a telescope's focuser. The drawtube holds the eyepiece, and the remainder of the focuser assembly permits the drawtube to move in and out along the optical axis. Double Cluster Visible to the naked eye as a hazy patch at the northern end of Perseus, the Double Cluster NGC 869 and 884 is resolved into a pair of rich masses of stars in binoculars or a small telescope. A low-power view like this gives the best impression of the sheer numbers of stars in the two clusters. DQ Herculis star cataclysmic variable in which the white dwarf component has an extremely strong magnetic field and rotates more rapidly than the orbital revolution (that is, it has non-synchronous rotation). Mass loss occurs from the main-sequence component, and although an accretion disk may be present, accretion on to the white dwarf occurs primarily through a column at the magnetic poles. There is persistent flickering, together with eclipses in those systems that are aligned with the line of sight. DQ Herculis systems are sometimes known as 'intermediate polars'. 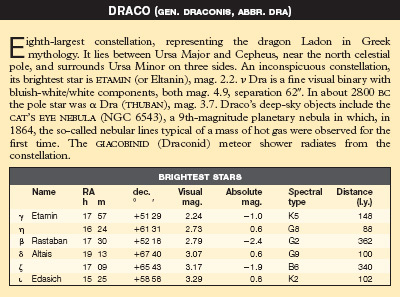 DRACO (gen. draconis, abbr. dra) tor (see birr castle astronomy), he began a systematic study of star clusters and 'nebulous objects' (in the 19th century, galaxies could not be distinguished from true nebulae). In 1888 he published the new general catalogue (NGC), following this up in 1895 and 1908 with two index catalogues (IC). To this day, astronomers use Dreyer's NGC and IC numbers. D ring Innermost part of saturn's ring system. Not a well-defined ring, it is not observable from Earth. drive Mechanism by which a telescope is moved quickly (slewed) from one part of the sky to another, or moved slowly (tracked) to follow celestial objects in their sidereal motion. A tracking motor can be use to turn the telescope about the polar axis of an equatorial mounting at the sidereal rate of one revolution per 23h 56m. Early versions used clockwork or falling weights to power the drive. Modern drives use electric motors, precisely regulated by quartz crystal oscillators. Typically, the motor drives a worm gear - a spiral cut on the surface of a cylindrical rotating shaft - which engages the teeth of a large gearwheel attached to the polar axis. The gear must be carefully engineered to minimize 'play', which is the back-and-forth motion (giving rise to the so-called periodic error) that occurs as first one tooth and then the next touches the worm. The residual errors of the drive mechanism have to be eliminated by the astronomer, who views a guide star in an eyepiece and continually makes small positional adjustments by pressing buttons on a handset. These adjustments are necessary to compensate for flexure of the telescope and its mounting as its position changes, for atmospheric refraction, and for errors in the gear construction. The most advanced telescope drives use computer control. In such systems, the computer rapidly and repeatedly calculates the required position of the telescope, determining for the time given by a quartz clock the hour angle and altitude of the object that it has been instructed to follow. The computer reads the telescope position from encoders attached to the two mounting axes (see also go to telescope). It is possible in principle to attain a pointing accuracy of 1" by these methods. The final adjustment of the telescope's position is made by visual inspection of the field of view, or by measuring the position of a guide star in the field, using a CCD camera. Both professional and large amateur telescopes are now commonly equipped with CCD-based autoguiders. Dubhe The star a Ursae Majoris, visual mag. 1.81, distance 124 l.y., spectral type K0 III. It is a binary star with a close companion of magnitude 4.8 that orbits it every 44 years. Dubhe is the brighter of the two Pointers to the Pole Star. Its name comes from the Arabic dubb, meaning 'bear'. Dumbbell Nebula (M27) Brightest planetary nebula in the sky. 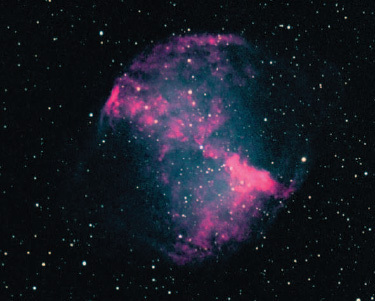 M27 (NGC 6853) takes its popular name from a description by Lord Rosse, who observed its hourglass shape in his 72-inch (1.8-m) reflector. The Dumbbell has an apparent diameter of 350" and overall magnitude +7.3. Lying in Vulpecula (RA 19h 56m.6 dec. + 22°43'), the Dumbbell Nebula is easy to find by sweeping 3° directly north from y Sagittae, which marks the tip of Sagitta's Arrow. The Dumbbell lies at a distance of 1250 l.y. Dumbbell Nebula The brightest of the planetary nebulae, M27 the Dumbbell takes its name from the two prominent lobes of material to either side of the central, illuminating star. Eighth-largest constellation, representing the dragon Ladon in Greek mythology. It lies between Ursa Major and Cepheus, near the north celestial pole, and surrounds Ursa Minor on three sides. An inconspicuous constellation, its brightest star is etamin (or Eltanin), mag. 2.2. v Dra is a fine visual binary with bluish-white/white components, both mag. 4.9, separation 62". In about 2800 bc the pole star was a Dra (thuban), mag. 3.7. Draco's deep-sky objects include the cat's eye nebula (NGC 6543), a 9th-magnitude planetary nebula in which, in 1864, the so-called nebular lines typical of a mass of hot gas were observed for the first time. The giacobinid (Draconid) meteor shower radiates from the constellation. Dunsink Observatory Oldest scientific institution in Ireland, founded in 1783, 8 km (5 mi) north-west of the centre of Dublin. Traditionally, its director was the Andrews' Professor of Astronomy in Trinity College; the best known of its past directors was William Rowan Hamilton (1805-65), eminent mathematician and second Royal Astronomer for Ireland. The observatory now houses the astronomy section of the School of Cosmic Physics in the Dublin Institute of Advanced Studies. Both observational and theoretical studies are carried out, with an emphasis on X-ray and infrared satellite data. dwarf galaxy Galaxy that is much smaller and intrinsically fainter than the familiar spiral and giant elliptical systems. A common definition has absolute visual magnitude fainter than -18; by this criterion the magellanic clouds are not dwarfs but all the other non-spiral members of the local group are. Dwarf galaxies are usually spheroidal or irregular in structure, and are often found clustered around brighter galaxies. dwarf nova (DN) cataclysmic variable that undergoes repeated outbursts. Outbursts are generally similar to those found in a nova, but with smaller amplitudes, typically two to six magnitudes. The rise from minimum to maximum takes place in one or two days, and the return to minimum generally takes several days. The average interval, in days, between consecutive maxima is called the mean cycle. Although varying from star to star, each star has its own characteristic mean cycle, which often alters within fairly wide limits. Approximately 370 dwarf novae are known. Physically, dwarf novae consist of a dwarf star or subgiant K or M-type star that fills its roche lobe and transfers material towards a white dwarf companion, which is surrounded by an accretion disk. In many systems a hot spot may be observed where the stream of material impacts on the outer edge of the accretion disk. In the variable-star classification scheme, dwarf novae are designated UG. They are divided into three main subtypes in accordance with their optical behaviour. Each subtype is designated by the name of a type star. The first subtype (UGSS) comprises the SS Cygni or u gemino-rum stars, which are named after the first two dwarf novae discovered. The cycles for stars of this subtype range from ten to several hundred days. Outbursts are termed either normal (short) or wide (long). The first have durations of a few days whereas the second last for up to about 20 days. Occasionally a star will take several days to rise to maximum; such maxima are called anomalous outbursts. Stars of the SU Ursae Majoris subtype (UGSU) have two kinds of outburst: normal outbursts last from one to four days; supermaxima last from ten to 20 days, during which time the star becomes from half to one magnitude brighter than at normal outbursts. For almost all maxima, stars of this type rise to near maximum brightness in 24 hours or less. Some have a short pause at an intermediate magnitude on the rise for an hour or two. They also have periodic oscillations (superhumps), with amplitudes of mag. 0.2 to 0.5, superimposed on the light-curve. Their period is about 3% longer than the orbital period. Dwingeloo Radio Observatory Dutch national centre for radio astronomy, situated some 45 km (30 mi) south of Groningen in northern Holland. It is home to the 25-m (82-ft) Dwingeloo radio dish, one of the oldest purpose-built radio telescopes in the world. The facility is operated by the Netherlands Foundation for Research in Astronomy, and its research includes surveys for radio emission from galaxies behind the Milky Way. dynamical parallax Method of measuring the distance to a visual binary star based on the estimated masses of the two components, the size of the orbit and the period of their revolution around one another. The angular diameter of the orbit of the stars around each other is observed, together with their apparent brightness, and by applying kepler'slaws and the mass—luminosity relation, the distance to the binary star can be determined. dynamical time System of time used since 1984 as the variable in gravitational equations of motion used for computing the predicted positions, or ephemerides, of the Sun, Moon and planets. Terrestrial dynamical time (TDT), an atomic timescale based on the SI second, is a continuation of ephemeris time, the system previously used in calculations of geocentric ephemerides. Barycentric Dynamical Time (TDB) is used in equations of motion of planetary bodies relative to the barycentre of the Solar System. dynamics Branch of mechanics devoted to the study of forces, accelerations and the resulting motions of bodies. newton'slawsofmotion are the basis of dynamics, and the application of these together with newton'slaw of gravity results in kepler'slaws of planetary motion. A body undergoing circular motion with a radius, r, and at a velocity, v, will be accelerated towards the centre of the circle by an amount given by v2/r. For an elliptical orbit, the centripetal force will vary as the distance from the barycentre changes, and the force will no longer always be perpendicular to the velocity, but the orbital motion is still governed by Newton's laws. dynamo effect Generation of a planet's magnetic field by electromagnetic induction arising from convective motions in the electrically conducting core of the planet. The power sources must be sufficient to overcome the natural decay of electric currents in a conductor of finite conductivity (that is, the magnetic Reynolds number must exceed a critical value). The motions must have an asymmetry (just as the field coil in a self-exciting dynamo is wound in one sense), and this is attributed to the cori-olis force arising from the planet's rotation. Cores in the terrestrial planets are iron-rich and thus electrically conducting; in Jupiter and Saturn they may be formed of metallic hydrogen, whereas for Uranus there may be a conducting electrolyte at its centre. The fields produced are strongly dipolar and roughly aligned along the rotational axes of the planets, except for Uranus. Reversals of the polarity of the magnetic field appear to be an inherent property of the core dynamo. Dyson, Frank Watson (1868—1939) English astronomer, the ninth astronomer royal (1910—33). He was co-leader, with Arthur eddington, of the 1919 total solar eclipse expedition that confirmed Einstein's theory of general relativity by detecting the Sun's gravitational deflection of starlight. Dyson supervised the royal greenwich observatory's contribution to the massive sky-mapping project known as the carte du ciel and studied stellar proper motion.